Considered by many people to be a nursery essential, baby oil is a fragrant mineral oil that often contains added ingredients such as aloe vera, vitamin E and lavender. Commonly used to moisturize skin, baby oil may provide an acceptable treatment or home remedy for health conditions or problems involving the hair in certain situations. Baby oil may help loosen stubborn scales of dried, flaky skin in the hair of babies and toddlers suffering from cradle cap, according to Lisa Chavis, registered pharmacist and author of "Ask Your Pharmacist." Called seborrheic dermatitis in medical circles, cradle cap is a temporary skin condition that occurs frequently in infants and babies up to the age of 3, according to the National Institutes of Health. Opt for unscented baby oil to minimize possible irritation to sensitive baby skin. Using baby oil in your baby's hair is a time-tested method for treating cradle cap, but follow through with extra care for your little one's head to achieve the maximum improvement in this common skin condition. Massage the oil thoroughly into your little one's scalp to soften the skin lesions, then work the pieces of dampened skin loose with a comb or brush. Always rinse the baby oil from your baby's hair using a mild baby shampoo or you may run the risk of worsening the condition by encouraging the buildup of additional skin scales. Many people suffering from head lice turn to baby oil to smother the microscopic insects. According to Jeffrey Hahn, an extension entomologist at the University of Minnesota Extension, this nonchemical treatment for lice achieves mixed results. At the least, removing the oil from your scalp is difficult with this type of treatment because the baby oil needs to remain on your head for a minimum of eight hours to drown the lice, according to Michigan State University Extension. Talk to your primary care doctor before attempting to use baby oil to kill lice, especially for children or babies. If you're pressed for time and need a quick pick-me-up for dull, lifeless hair, consider grabbing your baby's container of baby oil. 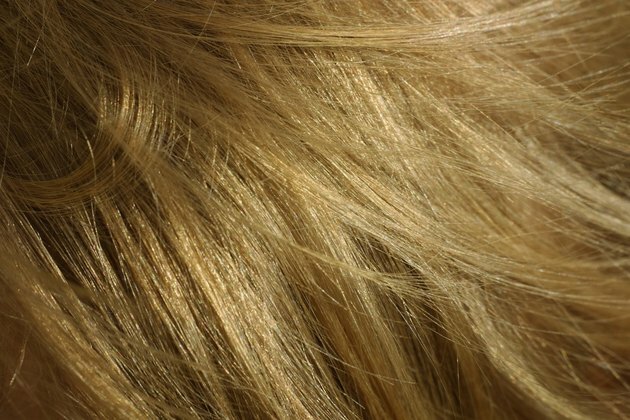 According to Diane Irons, an internationally acclaimed beauty expert and author of "Teen Beauty Secrets," adding a touch of baby oil to your hair may boost the natural shine present in your locks. Pour a penny-sized dollop of plain baby oil into the palm of your hand, and rub your hands together briefly before running them through your hair. Focus on the hair itself, avoiding the scalp to provide the maximum shine without adding excess oil to your skin. Baby oil may stain clothing and bed sheets that come in contact with it. As a precaution, lay a towel across your pillow before lying down if you have baby oil in your hair. Apply baby oil to your baby's hair in small amounts to minimize your chances of accidentally dripping it on expensive clothing, bed linens or new carpets. If you do spill some of the oil or your baby's oil-damp hair happens to come in contact with your clothing, soak excess oil up with a paper towel or clean cloth, and sprinkle cornstarch on it to absorb any remaining oil.